The Jeep Cherokee hasn’t had it easy ever since it came back, replacing the Liberty, in 2014. Gone was the traditional and much coveted longitudinal rear-wheel drive layout that made Jeep’s SUV so distinguished and capable for almost three decades. More civilized, and more carlike than ever before, the Cherokee unsettled the force with its controversial design, which incorporated an upside-down headlight arrangement, tiger-like front maw, and mall-friendly rear end. It was a stark contrast from its rugged, scruff-of-the-neck trail monger roots. It took some time, but five years later, the Cherokee is now an accepted compact SUV. The Trailhawk variant’s remarkable off-road capability has proven most naysayers wrong. And last year, Jeep shipped 23,702 examples of the thing in Canada alone. That’s just 744 units behind the Chevrolet Equinox. While it’s is still far behind market leaders like the Toyota RAV4, the Cherokee remains a heavily demanded vehicle. It was therefore fitting for FCA to give it a thorough facelift for 2019. Changes for 2019 are quite substantial, affecting styling, drivetrain, and interior appointments. Instantly recognizable is the more mainstream, angular front end, which now incorporates redesigned LED headlamps. The rear was also massaged; it now gets a new taillamp and bumper design. The new Cherokee gets an aluminum hood, a lighter composite liftgate with hands-free operation as well as a three-inch wider cargo floor, capless fuel filling, five new wheel options, a retuned suspension and steering systems, as well as new door-panel materials which contribute to 150 pounds in total weight savings. Inside, there are new dashboard materials and an improved version of the Uconnect infotainment system. 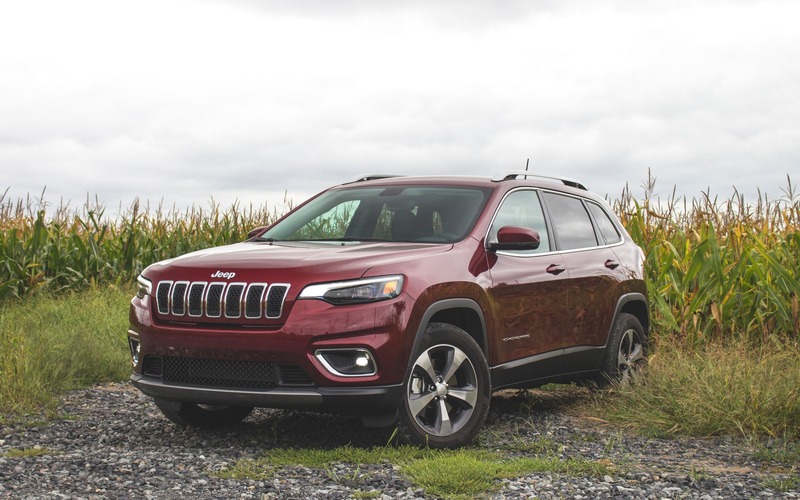 But the most significant change is under the hood, where the Cherokee now inherits an all-new, 2.0-litre turbocharged four rated at 270 horsepower and 295 lb.-ft. of torque. It slots between the already potent 3.2-litre V6 and the now aging and rather lethargic, entry-level 2.4-litre naturally aspirated four. All of them are coupled to a nine-speed automatic gearbox. My tester was a Limited version with the turbo engine and the Active Drive II four-wheel drive system which features a low-speed PTU, as well as 4-Low lockable front and rear driveshafts. Limited trim gives you Nappa leather seats, a full suite of electronic driving aids such as adaptive cruise control and rear brake assist, heated seats and steering wheel, as well as a media centre, which includes an Alpine premium sound system with subwoofer, an 8.4-inch touchscreen with navigation and two available USB ports up front to charge your beloved devices. It sells for a not-so-cheap $38,735. Improved Ride, But Where’s the Character? Thanks to revised dampers, bushings and anti-roll bars, the 2019 Jeep Cherokee is significantly smoother and more dynamic than its replacement. A lightweight, electrically assisted steering and a stiff chassis allow it to retain its urban runabout qualities. But there’s no steering feel at all. That’s somewhat excusable though, since most of its competitors aren’t exactly built for excitement either. The new turbo engine gets better low-end twist than the V6, 56 lb.-ft. more overall torque to be exact. It gets the Cherokee off the line respectfully quickly, but it’s entirely deprived from any sort of sound or character. It never feels exciting, eager, or enjoyable to listen to. It’s just a flat, soulless engine. And the nine-speed automatic, while smooth most of the time, often refuses to downshift, stuffing all the potential from its new engine. FCA claims turbo power improves fuel economy over the V6 by approximately 1 L/100 km. We recorded an average of 10.7 L/100 km while we had it. In this segment, that’s good, but it’s not great. That’s actually what shines through the most when driving the 2019 Cherokee. It’s… an SUV, one that does things well, but not fantastically well. In a world dominated by these things, and where excellent Japanese, Korean, and even American alternatives shine bright, how does Jeep’s family hauler distinguish itself from the pack? It does win points in the infotainment category, thanks to Uconnect’s simple, uncluttered, fast-responding and simply well thought-out interface. Cycling from one menu to the next is done in a breeze, and can also integrate Android Auto and Apple CarPlay. 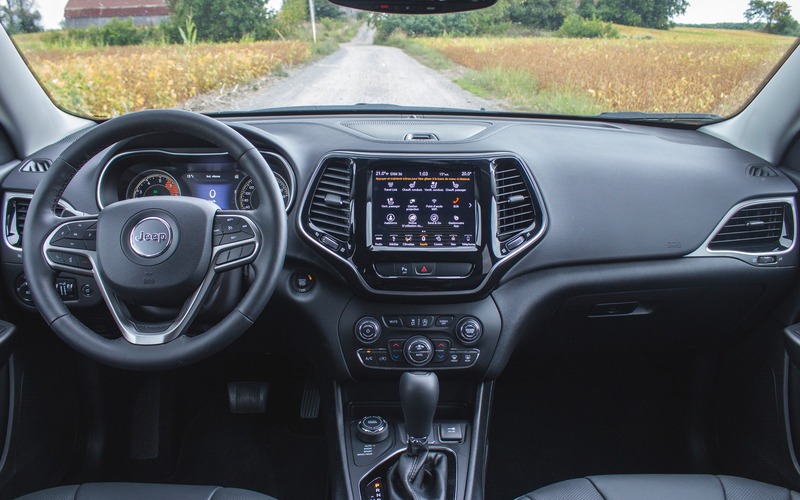 The Cherokee also boasts a quiet and roomy cabin. Rear leg and head clearance are ample, but overall cargo space is on the small side for the segment. With 1555 litres of space with all seats folded down, it trails behind other smallish compact SUVs like the Mazda CX-5 (1687 litres), even if FCA tried to improve the trunk’s width for 2019. Also, that interior is dominated by cheap plastics and sometimes questionable build quality. I guess the Cherokee sets itself apart with its wide variety of available four-wheel drive systems. Nobody in the industry can brag about the fact that its compact SUV has trail-rated off-road capability. But how much of it is important to the targeted buyer? Consumers who shop for a compact SUV want, first and foremost, abundant cargo space, fuel economy, safety and capability on slippery roads, all at an affordable price. The fact that it can climb over rocks is an added bonus, but not an argument to buy one. In the past, the Cherokee was a box on wheels with a two-speed transfer case, high road clearance, and a big gas guzzler of an engine. Sure, it was rudimentary, but it had character, and there wasn’t anything quite like it on the road. Today, one of the brand’s toughest nameplates has morphed into a profit-making, lukewarm mom-mobile that doesn’t do anything necessarily better than its extremely stiff competition. 5/10	We recorded an average of 10.7 L/100 km. In this segment, that's good, but not great. 6/10	The Cherokee boasts a roomy and comfortable cabin, front and rear, but cargo space is on the tight side. 6/10	The turbo engine puts down decent power, but the automatic gearbox smothers most of it. 10/10	Uconnect is easy to understand, fun to operate, and adapts well to Android Auto / Apple CarPlay. 8/10	This is a surprisingly spirited little runabout, handling is decent, and its reflexes are quick, perfect around town. 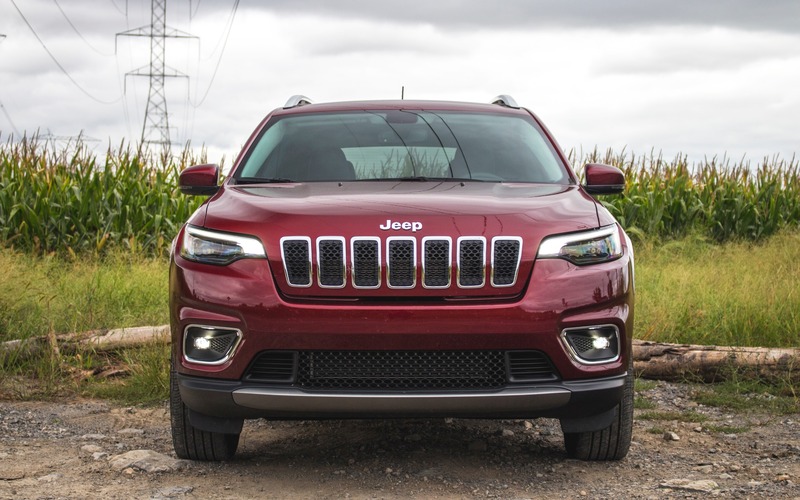 6/10	While the facelift does a lot to bring the Cherokee up to speed with the segment, it's still behind several of its rivals in terms of build quality, cargo space, and overall refinement.